I noticed a couple of times you've touched on the 'quality' of the code - I wonder sometimes if the programmer(s) simply didn't have the luxury of time to refine and optimise. Even myself back in the day would have segmented those routines into conditional sequences; simply better practice. But then saying that portions of this game code transcends into other titles/ or visa versa - perhaps they simply botch it together to get it out the door. Wow, you've really been moving this along lately. Looks great, keep it up! Glad you've been enjoying the updates. I appreciate this is a slow moving project. If there's anything in particular you want to hear about, let me know! I tested this bug on my upright running a stock Rev B board and I confirm the steering behavior. I even tried turning my wheel all the way right and then centering and the game still goes left after accelerating from a stop. I can't say I really noticed it before, I think I naturally compensated for it all this time. 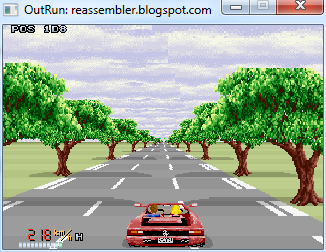 I've just tried out both of my Out Run boards, one of which has your new ROMs and the other has the old Japanese ROMs. In neither case did the car veer off to the left. I'm using a Power Drift control panel though, maybe that makes a difference? Magic Knight - That could well be the sensativity of the different control panel. If the steering value isn't stable, the bug wouldn't be triggered. I'm interested to test whether the Saturn port has this bug when I have a spare moment, along with some of the other issues. I've finished the interactions with scenery and sprites. I'm working on porting the traffic code next. My control panel is very stable, in test mode it always returns to a value of about 80 for the steering wheel's pot. What kind of values are you getting? When I used a PC wheel the pot would loosen up a lot and the car would drift to the right, so I have to tape it down. Not sure in that case - the bug is definitely there in Rev. B.
I can see the line of code that causes that behaviour and Alex verified above on hardware. I've had another mess around with my PCB. I could replicate your problem, but only if the car was in high gear. If the car was in low gear it seems to go straight every time. 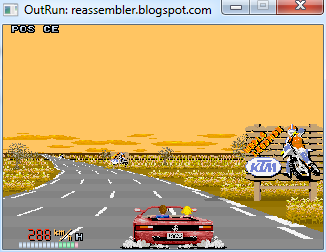 The effect in high gear is noticeable, but it's not nearly as dramatic as the effect in MAME. Unlikely it was intentional, but I have no evidence to back my belief up. The OutRun code is full of strange bugs, once you start delving into it. The Saturn hardware is ultimately an evolution of the OutRun boardset. I highly suspect that Rutubo used some kind of 68k -> SH2 conversion utility to directly convert the code. They were specialising in conversions of arcade ports, so reasonable to assume they had some kind of pipeline in place to facilitate the process.